As of 20 December 2014, this X-file is Open. Immediate Disclosure Requests have been filed with SF Rec & Park and CalRecycle in an attempt to shine some light on this business of using our tax dollars to fund toxic waste tire dumping on children’s playgrounds and playfields. SF Rec and Park has embraced CalRecycle’s incentive payment program and promoted the use of crumb rubber products by increasing the demand for their use on athletic fields in the City. The safety of these fields is questionable but the money goes directly into our enterprising Rec and Park’s budget no questions asked. With the new grant cycle soon to be up and running, and construction on the Beach Chalet Fields in the Far West portion of Golden Gate Park the subject of one of the City’s Turf Wars, some are asking questions. CalRecycle rolled out their grant program in FY2005-2006. Coincidentally, the first of the Rec and Park/CityFields artificial turf/SBR crumb rubber fields was rolled out that same year. Statewide demand for the grant money was and remains high. A lottery system was instituted to distribute awards to various qualifying projects throughout California. Park and Rec hit the lottery in 2007/8 when $68,250 was awarded to the Department for replacement of natural grass with syn turf at Kimbell Playground. Resolution 090839 by the SF Board of Supervisors authorized Rec and Park to accept and expend that grant money retroactively for the purchase of crumb rubber for the Crocker Amazon Complex Project. In FY2010/11, Rec and Park hit the lottery again, this time for $150,000, having applied for a grant for the Ocean View Playground Athletic Fields (prior to the renaming of the facility, which is now called Minnie and Lovie Ward). This project was not completed by the date required by the terms of the grant and is still under construction. The Board of Supervisors authorized Rec and Park to accept and expend the grant retroactively for tire derived materials for use at various City park sites for the period June 1, 2011 through March 31, 2013. The BOS resolution File #130178, Resolution #71-13 lists the various sites: Franklin Square, Garfield Square, Kimbell Playground, Silver Terrace, and Young Blood Coleman, and to help fund resurfacing costs at Cabrillo Playground, Lafayette Playground and Sunset Playground and, other park facilities that the Rec and Park Department determines might benefit from the use of Tire Derived Products. The crumb shuffle is not unusual. The production method, however, is. Tires are given the spa treatment in a bath of liquid nitrogen and fractured to usable size. At a pre-bid meeting for potential contractors of the Beach Chalet fields, registered turf installers were given the task of submitting a representative sample of crumbs with their completed bid packages. There was some resistance given the scarcity of material available and the chain of custody required for the material as required by the EIR. The location is over the Westside Groundwater Basin, to be used in the near future for the City’s potable water supply and is currently used for irrigation in Golden Gate Park. After lengthy discussion, Rec and Park Project Manager Dan Mauer told bidders to “do the best you can”. Somewhere, in theory, there are 700,000 pounds of crumbs (represented by a little evidence bag in RPD files) stockpiled and waiting to be spread around. One EPA study indicated that amounts of toxins in tire crumb in different field locations varied by degrees of magnitude. 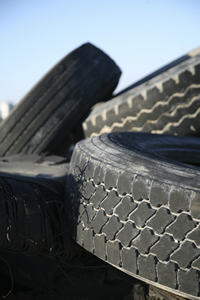 There is a strong incentive to dispose of properly Tire Derived Products, like those now found all over the City in children’s playgrounds and in and and around syn turf athletic fields that Rec and Park and the City Fields Foundation have built. A legal challenge to the proposed Beach Chalet Fields project under the California Environmental Quality Act (CEQA) questions the propriety of this disposal. Numerous recent medical and environmental studies point to the toxicity of the constituents of artificial turf/SBR infill constructions. The CEQA analysis relies upon independent judgement to decide whether a project may have the potential to cause substantial environmental harm. The potential for harm is there. The degree to which that harm exists is, at yet, under investigation. It’s a lottery. That judgement has been clouded by cash incentives is clear. How the court will rule on the case, currently under appeal, is uncertain. What is certain, however, is that tried in the court of opinion by an informed public, the alternative to these toxic constructions, real grass which was there all along, is the real winner. There’s good reason to dispose of tires properly. 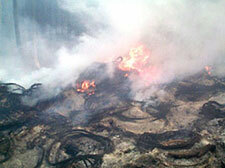 Fire speeds up natural processes which would occur more slowly under normal conditions. Superfund sites are the infamous result. Cradle to Cradle design is a laudable concept that does not apply when the materials being circulated are neither healthy nor safe. Tire manufacturing is toxic. New, used, and remanufactured products are the offspring of the toxic creation. To attempt a lifecycle development which incorporates direct human exposure to these toxins would seem ill-advised. Caution and common sense thrown to wind, in this case, is an ill wind that blows nobody to good. Still, in the “greenest City in the US” where our Rec and Park department is rolling out a greener than green campaign and championing a “Children’s Outdoor Bill of Rights”, streets, preschool floors, swaths and fields, and soon, whole schoolyards have been and will be paved with tire crumb and plastic. The paper tape tells the tale. It’s about money–a revenue stream. Here’s the rest of the CalRecycle grants reported for the City. Now you know why that used rubber is there in your neighborhood. acetone, aniline, arsenic, barium, benzene, benzothiazole, cadmium, chloroethane, chromium, cobalt, copper, halogenated flame retardants, isoprene, latex, lead, manganese, mercury, methyl ethyl ketone, methyl isobutyl ketone, naphthalene, nickel, phenol, polycyclic aromatic hydrocarbons, styrene – butadiene, toluene, and trichloroethylene. Other potentially hazardous chemicals in the mix are unknown, held as trade secrets by tire manufacturers.